You use you dryer everyday and don’t even realize how much lint builds up in your dryer vent, even when you clean out the lint screen after each load of laundry. This lint is full of dirt, debris, and the tiny fibers left behind from your clothes. So much build up can cause your dryer vent to clogged. This is a fire hazard but is easily preventable with a simple dryer vent cleaning. When your dryer vent accumulates with lint, your dryer is working less efficiently. It is wasting so much energy trying to you get air through. Your clothes will take longer to dry, your dryer could overheat and be damaged, a fire could start, and more energy wasted means an increased electricity bill. It is recommended to have your dryer vent cleaned once a year. 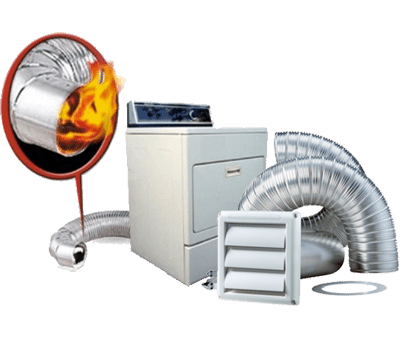 Our trained technicians use various techniques to do so, depending on the condition of your dryer vent. You want your dryer to work efficiently, without wasting energy, and a simple dryer vent cleaning can make that happen. Call us today to set up your appointment.